As described in About organizations and groups, groups are used to create collections of agents based on criteria those agents have in common. All agents must belong to at least one group, and they can belong to multiple groups. Administrators on Team, Professional, and Enterprise can add and edit groups; agents, and administrators on Essential, cannot. Note: Groups are not available on the Essential plan. How you set up your groups depends on how you want to define your workflow and organize your agents. You might create groups by skill (software vs hardware) or to reflect the organizations they serve (for example, a group might serve only customers in a certain region or time zone). Administrators can create groups, agents cannot. Community tip! Justin Graves shares his advice on what not to do with groups. Check out his tip in our community forums. If you want this group to be the default group that all new agents are added to, select Make default group. Administrators can view and manage all groups by selecting Groups on the People page. In Edit groups, you can change a group's name and add or remove agents. Note: Renaming a group has no effect on your business rules or reporting. Groups can also be deleted (the delete command is available when editing a group). Deleting a group has implications of course. Any business rules you set up using the group you deleted will no longer function properly. The group will be removed from any tickets it was assigned to along with any agents in the group. The ticket will return to unassigned, and you can see these updates in the ticket audits. Select the edit link next to the group you want to edit. Add agents or remove agents from groups by checking or un-checking the box next to their name. Click Make default group to make this group the one that all new agents are automatically added to. Click the Update Group button to apply any changes. Click the edit link next to the group you want to delete. A message will appear asking if you are sure you want to delete the group, select delete again to delete the group. Note: If the group is set as any agent's default group, you cannot delete it. You must change their default group first. See Changing the default group for more information. After you create an agent you can add them to either pre-existing groups or assign them to new groups. For information on how to create a new agent, see Adding end-users, agents, and administrators. Agents are added or removed from groups via the groups editor, accessed from their profile page. On an agent's profile page, click the Groups field. Select the group you want to add the agent to. A default group will automatically be assigned. See Changing the default group for information on how to change an agent's default group. Hover over Create a new group. Type your new group name. Click the add icon next to the new group name. Your new group will be created with the agent added. All of your agents will automatically be assigned to the first group you've created, but you can change individual agent's default group through their user profile. Select the agent's profile page. A dialog will appear with all of your different groups. Your new default group must be selected. If a default group is selected, it will look like the Documentation group below. Click on the current Default group name to open the default group drop-down menu. Select the new default group from the Default group drop-down menu. 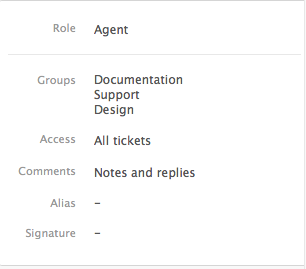 For Team and Professional, set Access to Tickets in agent's groups in the agent's profile. For Enterprise, select Agent can assign ticket to any group in the custom role for the agent. Note: On Team and Professional plans, when you restrict agent access to tickets within their group, those agents can no longer update end-user information or add end-users to tickets. Tickets can also be automatically assigned to groups using business rules (see Using groups in business rules below) and by enabling group mapping for an organization. Automatically assigning a group to an organization's tickets is a relationship you set up when creating or editing an organization. See Mapping a group to an organization. Groups can be used in automations, macros, and triggers. When creating automations and triggers you can use group as a criterion for making updates to tickets. Using a macro, you can assign a group to tickets as an action. There are many reasons that you might include group in an automation or trigger. Here are several examples of how they are commonly used. 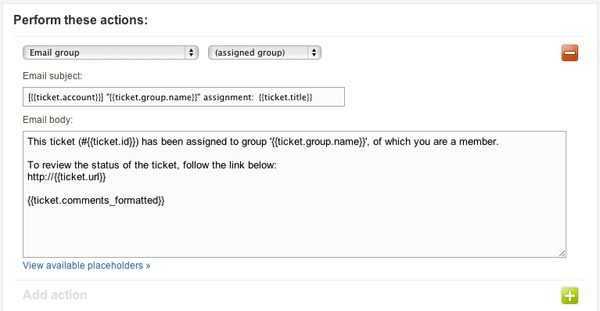 In an automation, you can use group as a condition to escalate tickets for a specific group. The Level 2 support team provides a higher level of service to their customers and promises to solve tickets quickly; this is their service level agreement. 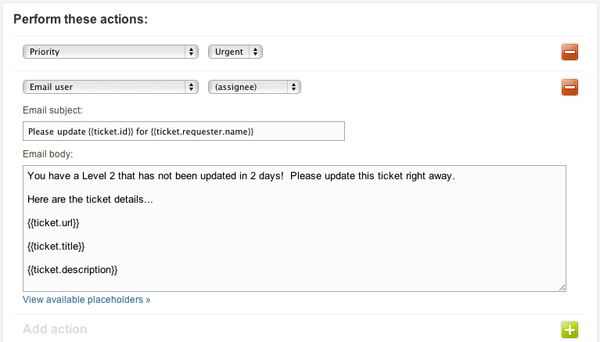 This automation helps them manage this commitment by reminding them if their tickets are not updated after 48 hours. The actions in this automation set the priority to urgent and send an email to the ticket assignee as a reminder to update the ticket. For more information about creating automations, see Streamlining workflow with time-based events and automations. Locate the Notify group of assignment trigger and then select Edit. This trigger fires when a group is assigned to a ticket. The change event could have been triggered manually by an agent or automatically by another business rule (automation or trigger). The actions inform everyone in the group about the new ticket assignment. For more information about triggers, see Creating and managing triggers. A group can be used as a condition in a trigger, which allows you to filter incoming requests and assign them to the appropriate group. In this example, the conditions are used to determine if the ticket is a sales inquiry. The actions set the type to Question and then assign the ticket to the Sales group. This example also illustrates that you can extend the use of Zendesk Support to other areas of your business, not just the Support agents. If only one agent belongs to a group, all tickets assigned to that group will be assigned directly to that agent. The status of the ticket will automatically move from New to Open. For more information about triggers, see Creating and managing triggers. Your groups can be used to create views. Here's an example. In the Shared tab, locate the Unsolved tickets in your groups trigger and then select Edit. This view displays unsolved tickets that are assigned to your groups. You could of course select one or more specific groups instead if you were to customize this view. This is the result, formatted as a table. The tickets are listed by groups. Is there a way to hide Groups so users can only assign tickets to a sub-set of groups? We are growing in leaps and bounds and the number of groups is getting large, so in order to streamline the options for certain agents it would be great to be able to tie certain groups together so that they see each other but not all of the other groups in our instance. Hi Emily - Check out the Assignment Control App. It won't do everything you are wanting but it will hide groups from other groups. I use it and it works very well. I am missing the option "Agent can assign ticket to any group" ... Is that option replaced by something else? On the Enterprise Plan, the 'assign ticket to any group' is set in the Agent Role. It only displays when an Agent has access to all tickets within their groups. For other ticket options, it does not apply. I am not sure if it displays on other plans. I don't see that option in pro-plan. My agents are able to reassign tickets to other groups, however I don't want them to be able to reassign tickets to the admin group. Is this possible, and if so how do I do this? I know you can give access to certain groups, however I don't want the deployment team to be able to see the tickets within the approval team. Nevermind, I've figured it out. I just need to create new views for certain groups. @Max - If you want to completely hide the Admin Group from the other groups then you need to install the "Assignment Control" app from the MarketPlace. Its under the "Zendesk Labs". We use this so our Help Center team can't forward tickets to our Web Development Team. It should work perfectly for your scenario. I want to escalate a ticket to another group / assignee. My question is, how will the original agent (who re-assigned the ticket) get notified with any new public comments on the ticket? For example, I handle Frontline Support. I re-assigned my ticket to another team for verification of the issue. While that other team / assignee is investigating, the client sends a response that I need to respond to. The new assignee is not supposed to respond. Is there a way for me to still get notified with updates on that ticket? So I can still respond when needed. Can you give us more details about what exactly isn't working? A screenshot of your trigger would be helpful, too. I'm trying to change the default group of a user in a trial account but it seems that step 3 under Changing the default group topic is not working. Did I miss any steps or configuration? In step 3, you need to select the new group before it will show up in the drop-down menu to be made the default. 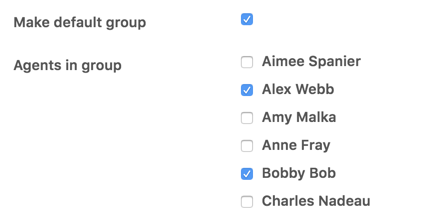 So, if your agent's current default group is Group A, and you want to change it to Group B, you need to make sure that Group A and Group B boxes are selected. Then, go down to the Default Group dropdown menu and select Group B as the default. From there, you can leave the agent in Group A, or you can uncheck the Group A box. Yup, it's now working. Thanks for the help Jessie. Thanks for the update, Jesse. Glad it resolved itself! Can I create an internal group for agents for the sole purpose of reporting. I have one support organization divided into two (or perhaps soon three) subgroups, they work out of the inbox so they have to be part of the "real" ticket group which we call 'Support' but I wan to divide this into subgroups - let's call them Support1 and Support2. I do not want a separate inbox/view for each group. I just want more internal structure which agent is part of which group and be able to generate reports based on the group performance instead of (like now) have to check each seperate agent to review Support1's performance. Just adding a new group didn't seem to work since I can't choose this group under reports. Apologies for the delayed response! You should be able to create as many groups as you want and Agents can belong to multiple groups. It can take up to 24 hours for everything to sync, so if you don't see a new group in your reports dropdown right away, give it a day and see if it populates. Hope that helps - let us know if you've got the problem solved or if you have more questions. Happy reporting! It still does not work however, I created a group after my last reply and added several agents to this new subgroup. Under Reports - Insights - "Insights - View only" - Ticket group I cannot choose this new subgroup even though it has been almost a month. I assume this is because no tickets are assigned to the agents under the newly created group. Since no tickets are assigned to this new "Support1" can I really get the reporting to work and if so how? If there are no tickets assigned to that group there won't be any data for Insights to pull in, so there won't be anything to see in Insights. Can you confirm whether there are any tickets assigned to the group in question? There is no tickets assigned to the newly created group (i.e. Support1) and there is no intention to have either, the reason for this is for the sole purpose of reporting. Today I have all my agents under the group 'Support' with it's corresponding view/inbox - however, the group is really divided into two subgroups in the business - both with it's own supportmanager. Both these managers want their own groups KPI's and in order to get that through insight I have to choose all the agents for group 1 manually. I suppose I could do a customized report (which I am also trying to do) where I add all the specific agents that is included in each group but then I will have to maintain these groups for all future because of people quitting and new people getting hired. I think we do something similar with our Tier 2 advocates. They work in squads that are each focused on a different part of the product and it looks like we created a custom attribute to report on each squad's activity. I'm going to touch base with one of my Insights gurus and see if I can find more information...we won't be able to build it for you, but hopefully I can give you some guidance. Stand by! I was able to get some confirmation on how we do this. We have an "About" dropdown field that has to be populated before a ticket can be solved; it basically records what the customer submitted their ticket about. We have an additional custom field called "Squad Focus", and a trigger that populates that field based on the About field when a ticket is solved. Pretty straightforward, actually! This is how we report on specialized product focus while keeping our T2 advocates in the same Group. Sorry if this is somewhere else, I can't find it. Where do we find the Group ID? Hi Heather, sorry for the mega-delayed response here! In the agent interface, you can get a Group ID by going to Settings > Manage > People > Groups, and right click/copy link on the name of the group you need the ID for. Otherwise, you can pull Group IDs using the API: Groups - Core API. I created some test groups in my Zendesk and deleted them afterwards as I am now working in the Sandbox. When I pull reports, those old test groups still show up. I know I can unselect them but is there a way to remove them completely? Seems like some leftovers from that old group (identical issue for deleted agents) still show up everywhere. Or is this something that will sync and get removed automatically? Welcome to the Community, Mathieu! I'm checking with some of our Insights experts to find an answer on this for you. Stand by! Once the data syncs from Zendesk to GoodData, the data is then available in GoodData even if it no longer exists in your Zendesk account itself (groups, organizations, ticket field options, etc.). Because that information is retained for future use in GoodData, once the old information or data is deleted from your Zendesk, GoodData can then perform a data reload on the account in order to remove that information. The exception to this is when permanently destroying tickets in the account. When a ticket is permanently deleted, it also be deleted from Insights/GoodData. Please let us know if you have further questions or concerns regarding this!